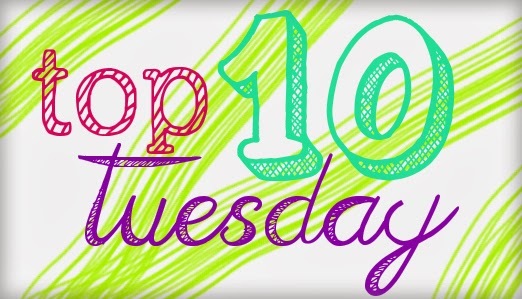 This week's Top Ten Tuesday prompt is the books that are sitting at the top of our Spring TBR pile. It could be wishlist books that are coming out in Spring that you really want to get your hands on, or books that you've been meaning to tackle and are determined to read this Spring. I went with the books that are at the top of my pile to read, like, yeterday, so most of mine are coming out in Spring or Summer, and are on my TBR as review books or for Fairy Tale Fortnight. So here are my Top Ten Books on my Spring 2014 TBR! Check it out, let me know what you think, and then tell me some of yours in the comments! Why: Nostalgic feel, has summer in the title. Might be wishfulness on my part, but SUMMMMMER. Why: Lurved Titan Magic (book 1) something fierce. Why: It sounds so cute and romanciful! Sometimes my shriveled little heart craves that. Why: It's a retelling of the Snow Queen, which I almost typed "Snot Queen," which is not a story I want to read, ever. Nobody write that. Why: I mean... the real question is, why not? This book sounds AWESOME. Why: This topic pushes a button for me, and I think I'm going to be very engaged. Why: I love after-death thrillers like this, plus Bethany is a Michigander! Why: Comparisons to The Perks of Being a Wallflower are enough to sell me. Of course, there are many, many more books on my TBR, and new ones are always being added. But these are the books that I'm most excited to read, and will read the soonest. Any of these calling your name, or in your Spring TBR pile? I really hope you get to Ophelia, possibly my favorite read so far this year! I really want to read Ophelia soon. Ha! I should put the second Laini Taylor on my list so I can move directly onto the third one when it releases! I really want to read My Last Kiss too. I have an ARC and plan to read it soon. Great picks! I am dying to read quite a few of these and have serious book envy right now! I am especially desperate to read Love Letters to the Dead, The Kiss of Deception and Stolen Songbird. I hope you find the time to get to them all :) My TTT.